A fast and reliable moving company in South San Antonio providing you with a stress-free moving experience! It’s no secret that moving is one of the most stressful events that most people will experience throughout their lives. Whether you have a large home or a small apartment, they both can be filled with lots of furniture, electronics, appliances and personal belongings. While your belongings are valuable to you, it can be a quiet a hassle to move everything on your own. First you have to get boxes, measuring tape, duct tape and the list goes on and on. It’s no doubt that moving can be an overwhelming task that leaves you frustrated, disappointed and annoyed. If you don’t want to deal with the stress of moving, we highly suggest you call our South San Antonio Movers. The employees of our South San Antonio Movers company handle relocations in San Antonio and throughout Texas. When it comes to moving your home or apartment, you want to make sure you are in good hands and that employees of the moving companies are friendly and professional. Our South San Antonio movers are professionally trained to handle your heirlooms and belongings with care. While you focus on important things like disconnecting your utilities and services, our movers will focus on handling your furniture with care. When you arrive in your new home, you can rest assured that your furniture will be in the same condition as you left it. Discover why many residents choose our moving company to help them with their relocation needs. Fast Service- Our movers in South San Antonio have a unique moving process that enables them to pack, load and unload your moving truck in an efficient manner. Reliable- When you put your trust in our South San Antonio moving company you can feel confident knowing that we will show up at your door before or at your scheduled time. This way you can handle all the other important details of your move while our movers make sure all your belongings are moved on time. Friendly- When our South San Antonio movers come to your home, you can rest assured they will have a smile on their face. At South San Antonio movers, we understand that you have special needs and requirements. This is why we make sure all of our movers are accommodating to your needs and wants. Trustworthy- When you have expensive furniture or heirlooms that have been in your family for generations, it is important that you make sure they are treated with care and respect. As professional movers that are licensed, bonded and insured, you never have to worry about damage to your most precious gifts. Our South San Antonio movers will take special care of your most valuable possessions. You can feel at ease knowing that your possessions will be safe from the time our movers leave your old home until the time they arrive at your new home. Professional- Our South San Antonio movers will always show up to your door with a nice and clean uniform. They will provide you with friendly service and listen to all of your needs. They are there to get the done job right and quickly. That is why our San Antonio movers never challenge you on rates or certain moving requirements you may have. The number one goal of our movers is to make sure you have a moving experience that you are happy with. Call now to request a quote from our South San Antonio moving company today! 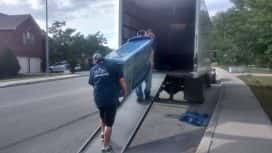 Whether you are moving from San Antonio to another city or you are moving right around the corner, you can rest assured that our professional moving company can help you have a stress-free moving experience. So call Texas Best Movers right now.